The other week I visited Latvia in order to see organic starch potato harvest and the starch production process at Aloja Starkelsen. You can find my earlier posts last year about the harvest in Finland and the production process at Finnamyl. My purpose was to see and photograph the harvest in Ledurga at Zigmars Logins’ Ozolini ZL organic farm (earlier photograph of his potato field here). However the harvest was postponed to following week as they were still preparing their two 3-row harvesting machines and emptying the warehouse of the organic oats they had harvested a few weeks earlier. Zigmars is Aloja Starkelsen’s biggest organic potato farmer with 55 hectares of organic starch potato. In total he is farming 400 hectares organically. Apart from potatoes his crop rotation includes grain and red-clover. The 3-row harvesting machine being prepared for action. Ozolini ZL organic farm in Ladurga. The potato stems have been cut and the potatoes are waiting for the harvesters. Aloja Starkelsen has 29 contract farmers for organic starch potato. 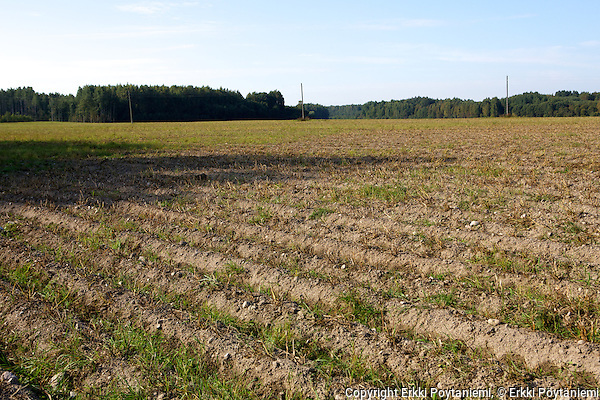 Apart from a few big farms like Zigmars’ they are smaller farms with just a few hectares of potatoes. One of these is the Segrumi dairy farm just 15 km from the factory. I visit the farm together with Aloja Starkelsen’s agronomist Aiga Kraukle. 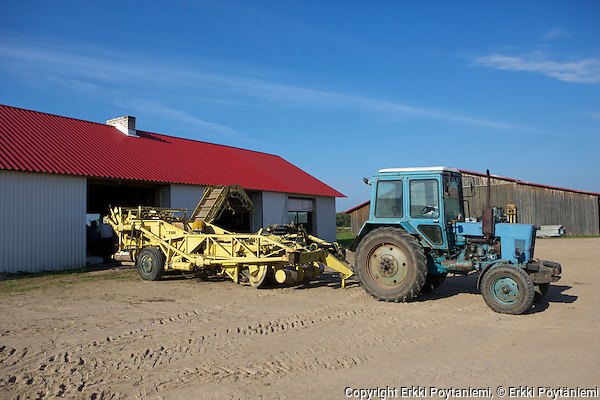 Segrumi has just 2 hectares of potatoes which they were harvesting. Naturally investment in machinery has to be lower when production is smaller. 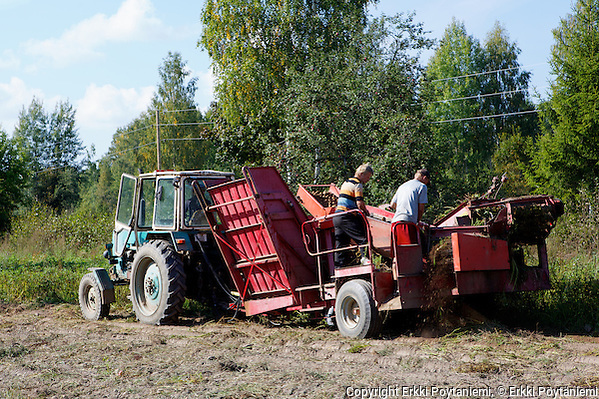 The old Finnish-manufactured Juko one-rowed potato harvester is pulled by an equally old Belarus tractor. Two men need to work the harvester to ensure that the potatoes flow well into the container. Yield is expected to be almost 20 tons per hectare and the starch content is high this year. 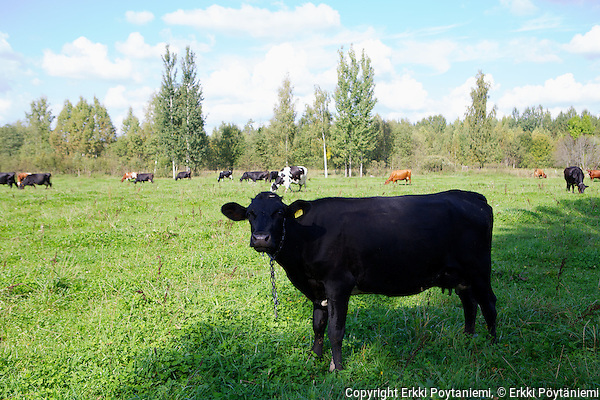 We also make a short visit to the farm where the dairy cows are on the pasture. The 2 hectares of potatoes brings the farm an important extra income. The farm has an old Finnish-manufactured Juko harvester. 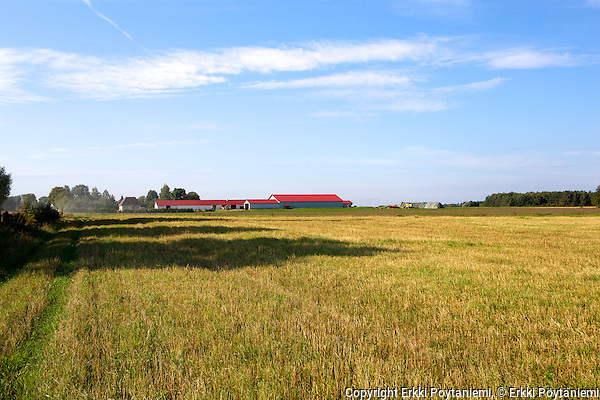 The Segrumi farm is a small dairy farm. Aiga also shows me around the Aloja factory. Previously I had not visited the factory during the campaign so it is interesting to see the factory in action. Of course the process is the same as at Finnamyl so it all looks familiar. On the Friday I visited the factory the production was conventional. The first organic production will be on Monday 16th September. 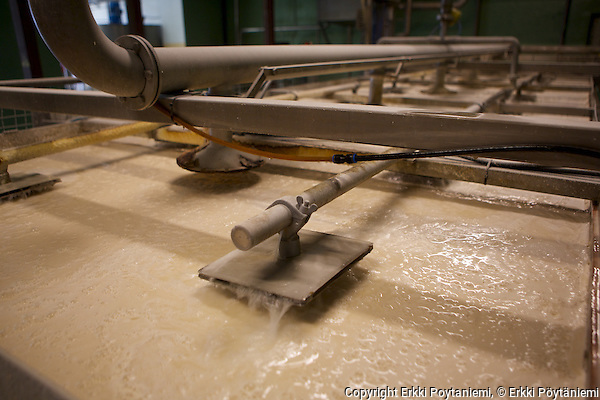 Finnamyl processed its first organic starch this year on 12th September. We expect normal to good yields in both countries so the outlook for this year is good. Potatoes must be carefully washed before going further in the process. 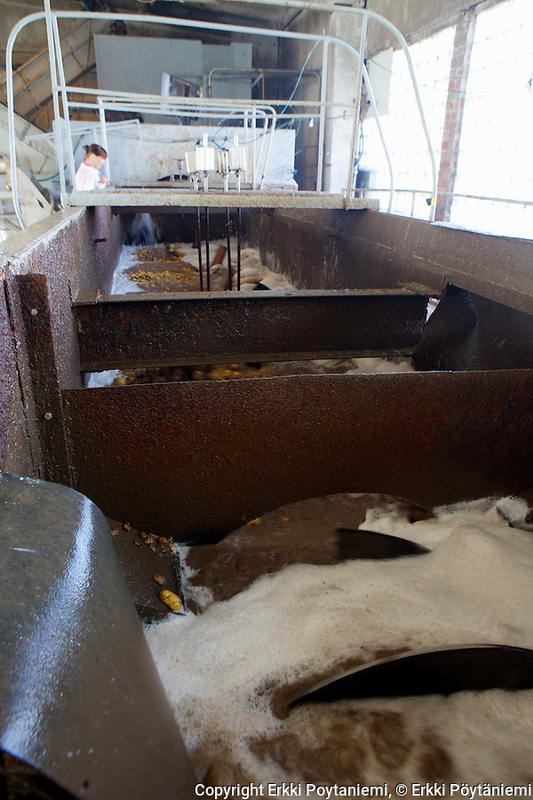 The starch is washed on the belt filter. 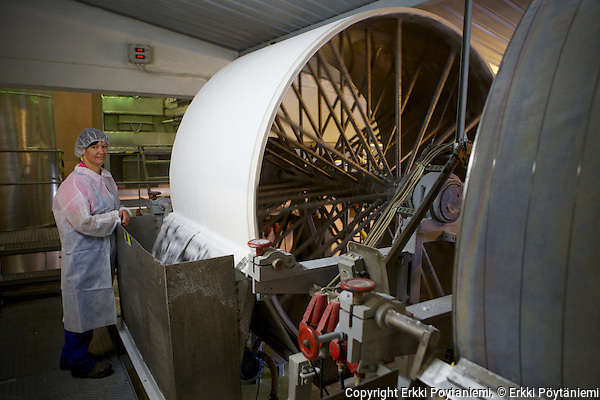 Aiga Kraukle and the potato starch coming off the vacuum filter. After this it is still dried and packed. 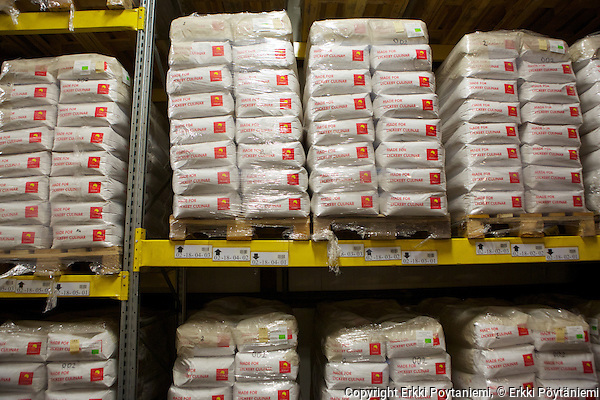 Organic potato starch in the warehouse. So the organic potato starch harvest and the campaign has started for this year!